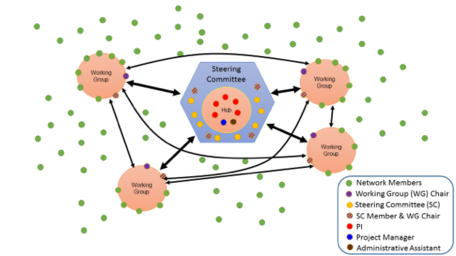 The Accelerating Systemic Change Network (ASCN) will serve as an open, interdisciplinary, professional network and intellectual home for individuals and groups in a broad range of disciplines who are engaged in creating and/or studying change in higher education. The ultimate vision of ASCN is that students in every institutional setting experience teaching that aligns with what we know about how people learn, and that draws in and supports all students. ASCN will help integrate what is known and soon to be discovered about organizing, leading, and evaluating change efforts to maximize the individual and collective efforts of network members. There is a need to accelerate development of research-based knowledge about how to scale and sustain changes in higher education that improve student educational experiences and outcomes. The research-based knowledge that does exist is scattered throughout many unconnected research communities, such as the various STEM disciplines, education, faculty development, management, and sociology. Many of the same change initiatives and related research questions are being pursued in different disciplines. Yet, the lack of a venue for sharing and improving this work severely limits the development and use of this knowledge. ASCN recognizes that higher education is a complex system. Creating successful change requires an understanding of and strategic work at multiple parts of the entire system. ASCN is designed around three overarching principles. These principles represent the core values that guide all network activities. Systems thinking. Higher education is a complex system. Creating successful change requires an understanding of and strategic work at multiple parts of the entire system. Important system levels include: individual, department, institution, and extra-institution. Important considerations include: connections between subsystems, feedback loops, cultural differences, and alignment of action. Thus, thinking about change from a systems perspective requires a diversity of perspectives. Breadth of perspective. Complex problems can only be solved through collaborative work of stakeholders with a broad diversity of backgrounds, experiences, and disciplinary perspectives. Specifically, the types of diversity we believe are most important to the success of this network are: individual members' racial/ethnic backgrounds, gender, career stage, position, disciplinary background and research expertise; and the types of institutions and other organizations represented. Serving all students.National-level strategies to improve undergraduate STEM education need to purposefully include all types of institutions that serve all types of students. While the ASCN will focus on institutional level change rather than individual programs of direct interventions with students, it will embrace this principle by engaging the spectrum of institutions that serve different populations of students. This includes minority-serving institutions, community colleges, urban institutions, primarily undergraduate institutions, as well as research institutions. Connect people and groups: ASCN connects and provides an intellectual home for researchers and change agents working on change in higher education. ASCN connects and coordinates with other national efforts that promote change in higher education. Curate resources: ASCN curates and create resources (broadly defined) that are useful for supporting the work of researchers and change agents. Working Groups: Each working group (organized around key topics in change), will develop projects that members can choose to be involved in. Current activities of each working group here. Steering Committee: Provide strategic guidance and support for the intellectual work of the community. See steering committee members here. Network Hub: Support the work of the ASCN by developing and maintaining structures, securing funding, setting initial agendas for the network, recruiting network members, and supporting working groups. ASCN has received funding from the Helmsley Charitable Trust and the National Science Foundation. In-kind support has also been provided by the Sloan Foundation and HHMI. If you would like to stay informed as our project develops, please join the network.